Walk into Singapore for a tryst with wildlife. Housing over 2,800 animals across 300 species of mammals, birds, and reptiles, this zoo is an open-concept habitat zone for the animals. All the species present here are kept in zones which resemble their natural habitat with only wooden fencing and moats separating you from the animals. You can explore the different zones at the park which are: Wild Africa, Reptile Garden, Great Rift Valley of Ethiopia, Treetops Trail, Gibbon Island, Frozen Tundra, Fragile Forest, Primate Kingdom, Tortoise Shell-ter, Australasia and the Orchid Garden. You will also get a tram ride which has an onboard commentary allowing you to learn more about the diverse species at the venue. There are shows and featured performances held for you daily at the venue. 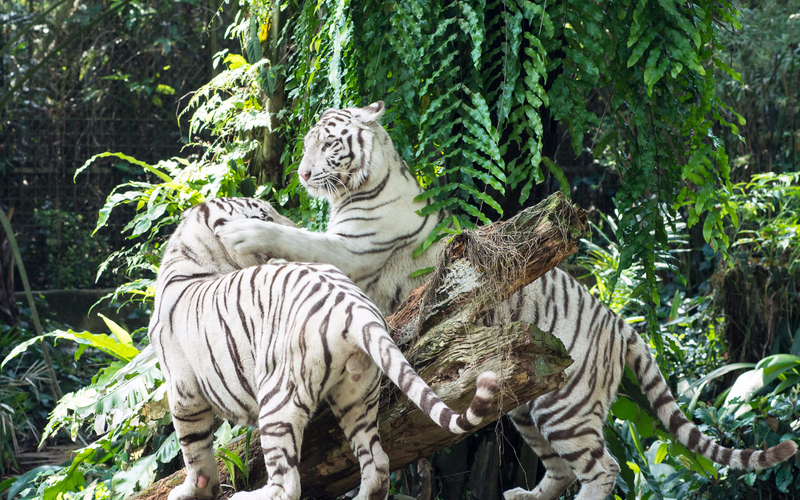 To know more about the shows and exhibits, read our detailed guide on Singapore Zoo. Venture into Asia’s first river-themed park and discover the ecosystems that sprawl across the famous rivers of the world. With zones made to resemble the natural topography of the rivers, each zone houses animals and fish indigenous to that area. 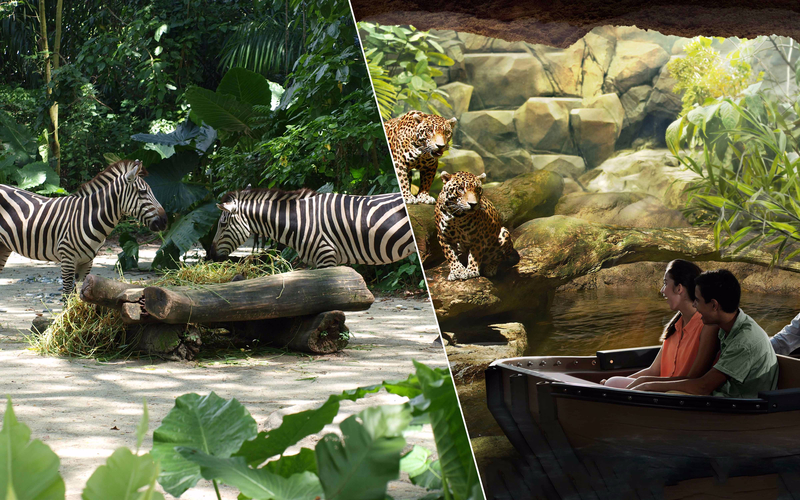 Explore the 10 different zones and witness over 5,000 animals when you visit the River Safari. To add to the experience, your combo also offers you two cruise vouchers at River Safari. One is for the Amazon River Quest where you can spot Brazilian Tapirs, Giant Anteaters, and Jaguars. The other voucher is for the River Safari cruise which takes you around the perimeter of the River Safari allowing you plenty of animal sightings. Discover the plethora of wildlife including Pandas, Elephants, Tigers, Lions and more! With elevated platforms, underwater galleries, and glass observatories enjoy watching the animals frolic from great vantage points. Guided Tram ride with commentary included. Meet Kai Kai and Jia Jia, the giant pandas at the Giant Panda Forest. Make the most of your combo vouchers by giving these attractions the time they deserve and visiting each park on a different day to fully explore all the sights within. However, should you wish to visit both parks on the same day, we recommend that you begin with the Singapore Zoo. Once you've explored the Zoo to your heart's content, feel free to move on to the River Safari to enjoy your two boat rides and finish your day on the relaxing waters of the park. The Singapore Zoo is open from Monday to Sunday, between 8:30 AM and 6:00 PM. River Safari is open from Monday to Sunday, between 10:00 AM - 7:00 PM. At the time of checkout, you will have the option to book vouchers for both adults and children. Child vouchers have reduced pricing so please select these according to the age specified for these vouchers. Please carry valid ID for all members in your party for whom you're booking reduced pricing vouchers to confirm their age if required. Tickets for both attractions can only be used by tourists and cannot be used by Singapore Citizens and/or Singapore Permanent Residents. Both the locations, the River Safari, and Singapore Zoo, are located in close proximity to the other and you can just walk to the other park. Located on Mandai Lake Road, the venue is easily accessible by cars and metro alike. Take the Red line and transit to a connecting bus, preferably route no 927 or no 138. 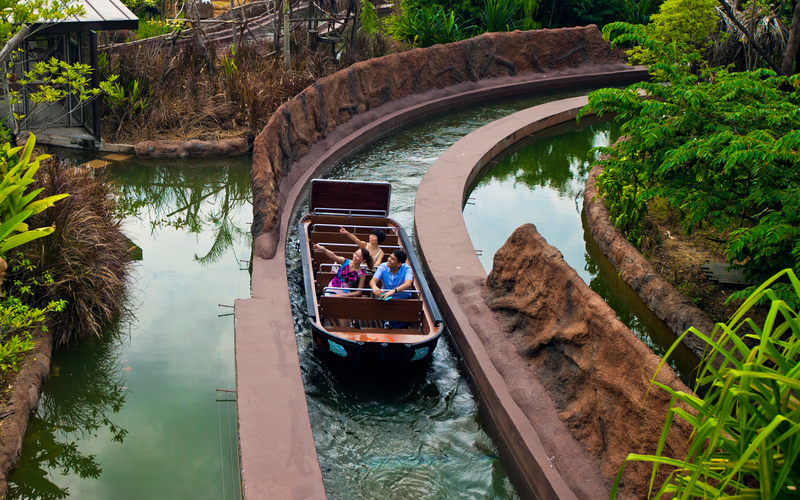 For Amazon River Quest boat ride at River Safari, riders must be at least 1.06 meters tall. Kindly refer to complete guidelines at www.riversafari.com.sg. You will get an email confirmation shortly containing your mobile vouchers for both Singapore Zoo and River Safari. Please display your vouchers on your mobile phone with a valid photo ID at the redemption counters 3 to 8 of the Singapore zoo to exchange them for tickets. The vouchers are open dated and are valid for a period of 60 days. Once the voucher is redeemed at the vouchering counter at Singapore Zoo, however, you must use the voucher on the same day. This applies to both attractions. Amazon River Quest boat ride will be closed for annual maintenance from 10-24 September 2018. Tram ride with commentary at Singapore Zoo. River Safari Singapore admission voucher. Amazon River Quest Ticket at River Safari. River Safari Boat ride voucher at River Safari. ATMs, Lockers, nursing stations are available at the zoo for your use. The charge for lockers is SGD 5 for the first 3 hours followed by an additional SGD 1 for each hour. The Zookeepers are spread over the park and will answer any query you might have regarding the animals or the zoo itself. 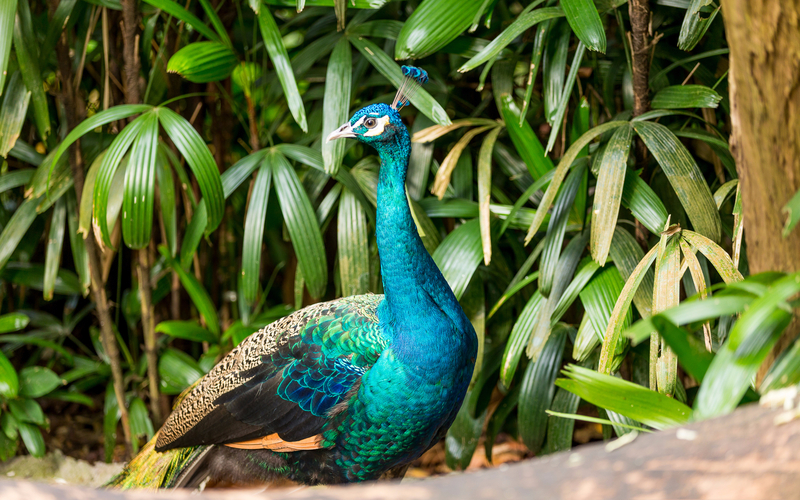 Your Singapore Zoo vouchers are valid for an entire day and it is possible to re-enter the Zoo for which you will have to get the voucher stamped for re-entry at the exit. Please carry sun glasses, a hat, an umbrella and a water bottle for personal use. Wear comfortable walking shoes as the zoo has a fair amount of walking. 85% of the animal exhibits are accessible by foot while the other 15% are viewed from the river cruises. Wear comfortable walking shoes to explore the venue at ease. The main attractions of the park are the Giant Panda Forest, Amazon River Quest, and the Amazon Flooded Forests. ATMs, lockers, nursing stations and prayers rooms are available at the venue. The locker costs SGD 5 for the first three hours, following which a 1 SGD fee will be levied for each hour. Strollers, wheelchairs, and mobility scooters are present at the venue for children and guests with impaired movement. Strollers can be rented at a 9 SGD fee while the cost of renting a mobility scooter is SGD 35. Wheelchairs are free-of-charge. Tickets to the Beaver Encounter and the River Trails experience must be purchased separately at the venue. Uniformed staff members are present through the park to assist you with any query.